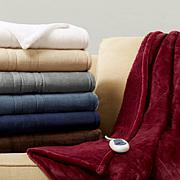 Immerse yourself in comfort in this plush, heated throw. State of the art Secure Comfort heated technology adjusts the temperature based on overall temperature, spot temperatures and the ambient temperature of your room, ensuring a consistent flow of warmth. And it's nearly a foot larger in length and width compared to standard heated throws, so let the snuggling begin. These throws are so soft and warm not to mention the attractive look. Love them! This blanket is really soft and comfy. The heat works very nicely. I have fibromyalgia and use it as a giant heating pad and it's great. We recieved our heated throw on the first, chilly morning of the season, and it was a welcomed relief! I had hoped it was a "silky, luxurious' feeling and it is!! Yay! Looks great, and feels great! What more could you ask for?? Bottom line? L0VE IT!! We ordered the gray and want more! Love the color choices and know that my family members will fight over this if I don't order more! Tks HSN! Have only had this blanket since January. Have washed a few times - washed well. But already (and not after washing) is no longer heating. Very disappointed because when it worked it was great.